The response to the Congo Clinic Initiative has been overwhelming! Over 60 churches, groups, and families have committed themselves to partner with a clinic for the next five years. 60! And the Congo Clinic Initiative is a project of reciprocity. This means that more than 60 partners will spend five years not only raising the standard of medical care in Congo, but also receiving information and opportunities to transform their own lives by connecting with this vibrant country. Over 60 partners have said that they are ready to give, and our deepest prayer is that they are also ready to receive. Paul Carlson Partnership is committed to walking alongside our partners in Congo. We are so blessed that you are on this journey with us, and we hope that each of you are blessed as we travel together. This touching story was sent to us from Wisconsin, where the Burns family heard about the Congo Clinic Initiative in church. Learning about a clinic in Congo without supplies, and his church’s plan to help, inspired a young boy to give from the heart. A few nights before Christmas Eve, we asked the kids what we should do regarding the Advent Conspiracy at church. They both agreed to give the money from our coin jar, which was just about full. Typically we cash out the coin jar when it is full and go do something together as a family. The kids decided we should give the money away this Christmas. We then listed the different options of things to give too. Immediately Grant spoke up, “We need to give the money to the Congo clinic.” We asked if he wanted to give all the money to the clinic or split it up between different charities. He was adamant that all the money should go to the Congo. Grant remembered me telling the kids that Dr. Jim had said that they don’t even have enough stethoscopes at the clinic. The kids went off to gather extra coins that they had to add to the jar (as well as look under the sofa cushions). Without any prompting or words from Jeremy or I, Grant came back into the kitchen, dropped some coins into the jar and then stuffed 12 $1 bills into the jar. He looked at me and said “I just want to add a little extra money to help the clinic.” He then went on his way like it was no big deal. I, however, was very touched by his tender heart. $12 is no small amount for an 8 year old boy who loves to save his money for Legos. Just to add a little fun, we had a contest to see who had the closest guess of how much money was in the jar. 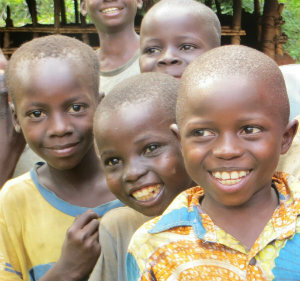 Grant’s $12 can save four lives in Congo this year. His family’s $83 can provide a clinic with more than a two week supply of pharmaceuticals. When families come together, Grant’s church can support an entire clinic for a year and install solar power. And when this church joins forces with 107 other clinic partners, we will collectively raise the standard of medical care in the Equateur Province of DR-Congo.